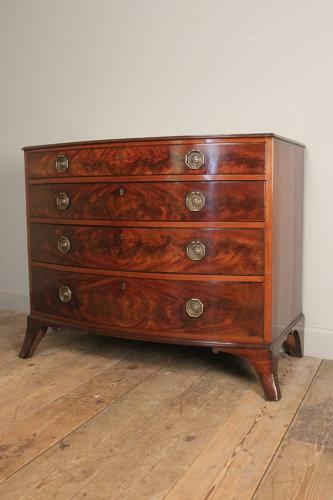 A beautifully proportioned Mahogany bowfront chest of drawers from the Regency period, having 4 strongly graduated figured drawers, retaining the original lacquered plate handles and escutcheons. This chest is super quality and fully Mahogany lined, raised on exaggerated splay feet. Wonderful colour and condition throughout thic classic piece of English furniture. Circa 1810.